The A-bomb's impact on human bodies is broadly divided into acute disorders and aftereffects. 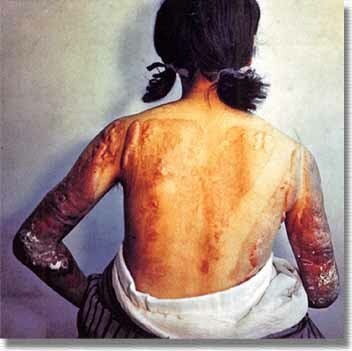 In Hiroshima, acute disorders caused by heat rays, fire, blast, and radiation appeared immediately after the bombing. These effects faded in four to five months. Even after the acute disorders were healed, however, the effects of the A-bomb continued. The aftereffects included keloids (excessive growth of scar tissue over a burn) and leukemia. The number of survivors contracting leukemia increased noticeably five to six years after the bombing. Ten years after the bombing, the survivors began contracting thyroid, breast, lung and other cancers at higher than normal rates. Many babies inside their mothers' wombs at the time of the bombing died before they were born. Of those born alive, some had a syndrome called microcephaly. Keloids and puckered skin caused terrible physical and emotional pain.